Gecić Law at the Law Firm Marketing Summit 2018 in London! 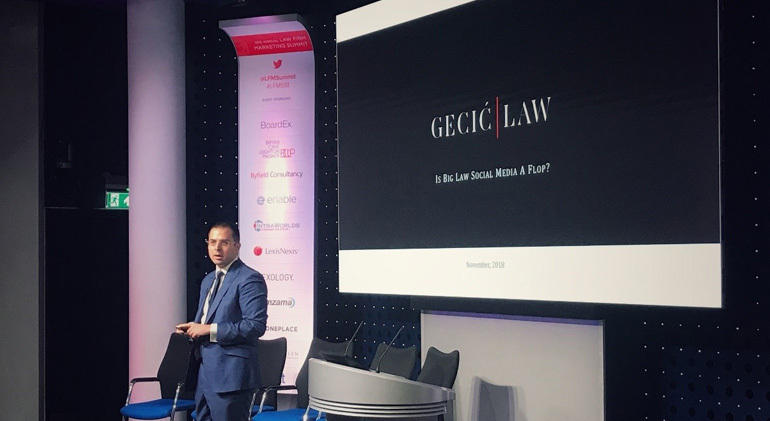 Bogdan Gecić, managing partner at Gecić Law, a top tier law firm from Belgrade, gave a lecture on the importance of social media and communication at the Law Firm Marketing Summit held in London. “Social media are an important tool to cement presence on the Internet and share the values of your firms with the public”, said Mr. Gecić. “We do not only embrace social media as a medium of promotion of our firm and corporate life within the office, but we also share the successes of our partners and clients because we believe in the idea, as we dubbed it, that sharing is caring”. Furthermore, upon the invitation of Dr. David Cowan, Editor-at-Large of the Global Legal Post, Mr. Gecić gave an interview on the future of the legal profession and commented on the correlation between law and technology. “Gecić Law follows closely the developments in technology and studies carefully how new technologies influence the law, and how the law influences new technologies”, Mr. Gecić stated. “From social media, to GDPR and Blockchain, the world we are living in is a fascinating and dynamic environment, and our firm and team is proud for being able to keep pace with innovations”. Organized by Global City Media and the Legal Media Monitor, and with one of the sponsors being Terralex, one of the leading legal networks in the world, the Summit was held in London and welcomed more than 150 attendees from prominent law firms and companies from all over the world. This is the third consecutive year that the Summit is being organized, with a growing number of attendees and lecturers from the leading law firms and corporate communication agencies. The Summit is the most widely known conference of this kind in the legal world and the organizers recognized Gecić Law as one of the leaders in the field of legal marketing and communications. Alongside Gecić Law, the attendees had the opportunity to hear about the strategic approach to legal marketing from leading professionals coming from Deloitte, Baker McKenzie, Bird & Bird and other eminent consultancies and law firms. The Law Firm Marketing Summit 2018 has been a tremendous opportunity to better understand how technology and marketing interconnect in the field of law – from debates about Hogan Lovells Engage, a new platform commenced by our colleagues from Hogan Lovells and integrated marketing strategies explained by Baker McKenzie – to social media strategies provided by our law firm, the Summit is an impressive platform to share experience and implement new ideas. It was truly a great opportunity to listen and debate how important strategic thinking is in relation to legal marketing and client – law firm relationship. We would like especially to praise our friends and partners from leading international firms on their great presentations and lectures that our firm is, and will be implementing: Terri Pepper Gavulic from Terralex and Brian Gribben from Arendt & Medernach on pricing strategies, Gaia Francieri from Chiomenti, Michael Millar and Hélène Préchac from Hogan Lovells on the issue of smart content and Peter Byre from Digital Whiskey on marketing strategies. The honor to be invited to present our ideas and lecture at this esteemed Summit, testifies that Gecić Law is recognized globally as the leading law firm in the Western Balkans, and is ready to contribute to the global legal discussions in all the fields of the law. If you are eager to contribute to the global legal discussions, share your views and comments on corporate life and values, and check out our Facebook, Instagram, Twitter and LinkedIn profiles for more updates on our work!